Chinese New Year again and this time it's the Year of the Golden Pig - R*'s year. We celebrated by going down to London's Chinatown with some friends on new year's day and having dim sum. We arrived before the restaurant opened to make sure we could get in. Our friends were dim sum virgins so we had fun introducing them to all kinds of dishes. Afterward, we joined the thousands and thousands of people who had come to see the parade and festivities at Trafalgar Square. 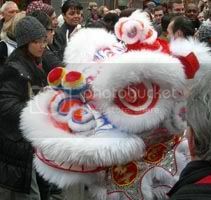 The picture is one of the many lion dances that took place in chinatown. The event is huge. We couldn't get a good view of the stage at Trafalgar Square so we eventually gave up and went down the the Victoria & Albert museum. It was quieter there this year but the smaller scale allows the kids to see more. As I said last year, it sure would be nice to see more contemporary Chinese art than the same old traditional stuff.